The Hands Of The GOP Are Quite Busy During 2012's End. Republicans' Push America Over The Fiscal Cliff, With One Hand, While Pushing the World's Disabled Under the Bus With the Other. Happy New Year Republican Style. WASHINGTON  Former Senator Bob Dole of Kansas sat slightly slumped in his wheelchair on the Senate floor on Tuesday, staring intently as Senator John Kerry gave his most impassioned speech all year, in defense of a United Nations treaty that would ban discrimination against people with disabilities. 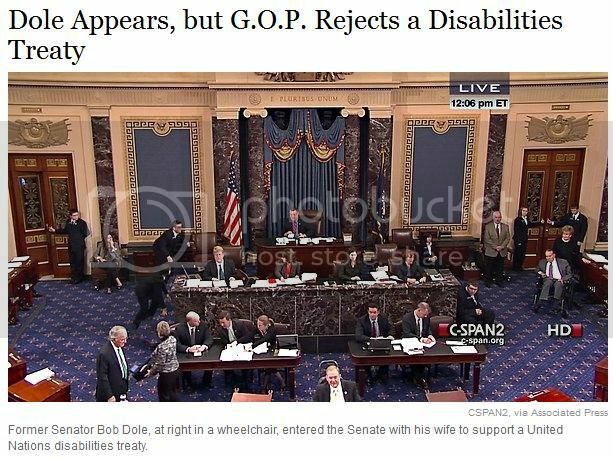 Senators from both parties went to greet Mr. Dole, leaning in to hear his wispy reply, as he sat in support of the treaty, which would require that people with disabilities have the same general rights as those without disabilities. Several members took the unusual step of voting aye while seated at their desks, out of respect for Mr. Dole, 89, a Republican who was the majority leader. A majority of Republicans who voted against the treaty, which was modeled on the Americans With Disabilities Act, said they feared that it would infringe on American sovereignty. Among their fears about the disabilities convention were that it would codify standards enumerated in the United Nations Convention on the Rights of the Child  and therefore United Nations bureaucrats would be empowered to make decisions about the needs of disabled children  and that it could trump state laws concerning people with disabilities. Proponents of the bill said these concerns were unfounded. The measure, which required two-thirds support for approval, failed on a vote of 61 to 38. Mr. Kerry, Democrat of Massachusetts, his voice rising as senator after senator moved slowly into the chamber, rejected the concerns of Republicans and made a moral argument for approval of the treaty. He is here because he wants to know that other countries will come to treat the disabled as we do, he added. A handful of Republican senators voted for the measure, notably Senator John McCain of Arizona, in opposition to the other Arizona Republican, Senator Jon Kyl. The others who supported it were Senators Kelly Ayotte of New Hampshire, John Barrasso of Wyoming, Scott P. Brown of Massachusetts, Susan Collins and Olympia J. Snowe of Maine, Richard G. Lugar of Indiana and Lisa Murkowski of Alaska. Senator Jerry Moran of Kansas praised the treaty in a news release with Mr. McCain in May but voted against it. Senator Thad Cochran of Mississippi voted yes at the beginning of the roll call vote and then switched his vote to no. Calls to the offices of Mr. Moran and Mr. Cochran were not returned. Senator Harry Reid of Nevada, the majority leader, said the measure would return to the Senate floor in the 113th Congress. It is a sad day when we cannot pass a treaty that simply brings the world up to the American standard for protecting people with disabilities because the Republican Party is in thrall to extremists and ideologues, he said in a statement.